Yoho National Park on the British Columbia/Alberta border is home to waterfalls, glacial lakes, snow-topped mountain peaks, roaring rivers, deep silent forests, and spiral tunnels inside the mountains. Through erosion, nature has carved some of the most dramatic landscapes in the country. See the natural rock bridge spanning the Kicking Horse River, and visit the Kicking Horse Pass National Historic Site. See the Hoodoos, immense boulders balanced atop tall pillars of glacial till. By the time Hwy 1 reaches the park’s headquarters in Field, a distance of about 18.5 miles (30 km), the tone of the landscape shifts to one of glaciated Rocky Mountain peaks. 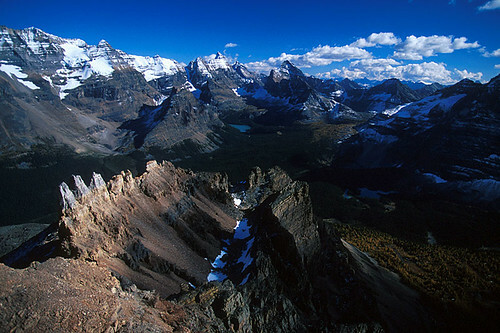 The east gate of the park is at the British Columbia-Alberta border on the Continental Divide. Total distance between the two gates is about 30 miles (48 km). About 1.5 miles (2.5 km) west of Field, Emerald Lake Road leads north from Hwy 1 to the parking lot beside Emerald Lake, the largest lake in Yoho National Park. 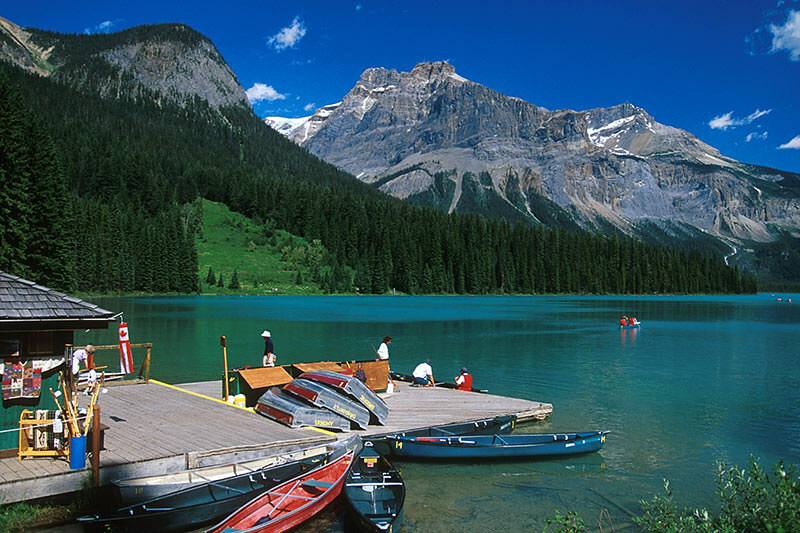 Yoho National Park is open year round. All major travel routes are maintained throughout the year, although temporary closures may come into effect in the event of adverse weather conditions. The peak season in the park is during July and August. If you are planning a trip to Yoho National Park during these months, be sure to book your accommodation in advance. The Parks Canada administration office in Field is open year-round, except holidays, from Monday to Friday, 8:00 a.m. to 12:00 p.m. and 1:00 – 4:00 p.m.
Yoho National Park has campsites that range from vehicle/tent sites to walk-in wilderness campsites. Kicking Horse Campground, located 3 miles (5 km) west of Field and handy to hiking trails and the Takakkaw Falls, could be considered the main site, with its playground, amphitheatre, and nearby grocery store. Open from May to October; amenities are the same as Hoodoo Creek campground with the addition of hot showers, a wheelchair accessible washroom with shower. In July and August plan to arrive early as the campground is usually full before noon. Effective immediately, all users of the Kicking Horse Campground are required to boil their drinking water. Monarch Campground is situated within walking distance of Kicking Horse campground. Open from mid May 1 to September 5, Monarch offers a different camping experience. The 46 sites are located in a big meadow. Well water with pump, pump out toilets, shelter, recycle shed, food storage, a smoke-free area. Hoodoo Creek Campground is in a heavily wooded area and is near several trailheads. It’s 15 miles (23 km) west of Field. Open from mid July to mid September, services include flush toilets, piped hot and cold water, kitchen shelters, fire rings and firewood, playground, campfire interpretive program, walking trails, recycling bins, food storage, sanitation station. Takakkaw Falls Campground is about 10 miles (16 km) up the Yoho Valley Road from Field. This site has a great view of the 2,211-foot (675-m) falls and affords access to many of the trails in the Yoho Valley. Open from mid June 23 to September 29, please note road closed October 1. The campground is a tent walk-in campground only but a cart is provided for moving gear. Vehicles towing another unit cannot make it up the switchbacks on the Yoho Valley road to Takakkaw Falls. There is an unbeatable view from most of the 35 sites. Well water with pump, pump out toilets, kitchen shelter with stove, fire rings and firewood, recycle shed, food storage. Yoho operates 6 backcountry campgrounds, 4 in the Yoho Valley and 2 in the Ottertail Valley. Park staff at the Field Information Centre are available to help you plan your backcountry trip. High peaks, cirques and rock basin lakes, alpine larch stands, rock lichens, alpine plants — this is the Lake O’Hara Valley. These special features attract many visitors who wish to experience the area’s unique beauty; however, the area’s fragile alpine environment is susceptible to damage from overuse. A quota helps minimize impact and supports a quality wilderness experience. Lake O’Hara Campground is 7 miles (11 km) up the Lake O’Hara Road from Hwy 1 on the east side of Spiral Tunnels, followed by an 8-mile (13-km) hiking trail. If you’d rather not walk in, you can access this campground by bus. Reservations are required to take the bus to Lake O’Hara for day use and camping. The bus operates from June 17 through September 30, plus reduced bus schedules from October 1 through October 5. 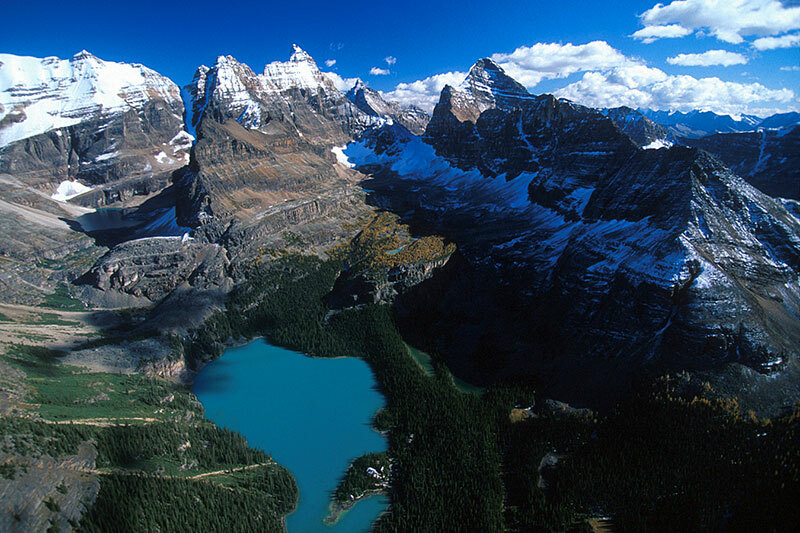 To protect this sensitive alpine area, a quota system limits the number of visitors using the public bus service into Lake O’Hara; consequently, not everyone will be able to book bus reservations. Lake O’Hara Reservation Line Hours of Operation (March – October) – Telephone: 250.343.6433 Mountain Time. Parks Canada reserves six day-use places and three to five campsites for 24-hour bookings. These places are reservable by telephone only. They can be booked by contacting 250.343.6433 the day before you wish to visit O’Hara. Each individual may reserve either two day-use places, or one campsite. These are usually filled within 10 minutes of the office opening. There are no restrictions on the number of people who wish to hike the 11-km access road. 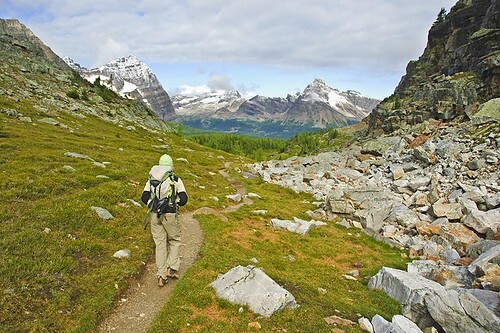 Trails at Lake O’Hara are usually snow-bound or muddy until early July. Higher trails are not accessible until late July. These conditions make the trails highly susceptible to erosion. Please stay on trails and obey all closure signs to minimize your impact. Cycling is not permitted on the Lake O’Hara road. You may walk your pet on leash into the valley, but pets are not allowed on the bus. Each camper is restricted to 1 large or 2 small pieces of luggage (20 kg maximum per person – the bus driver can refuse anything over this). Backpacks are recommended. To protect other baggage, ice axes and crampons must have protective coverings. To maintain a backcountry atmosphere, musical instruments, radios and lawn chairs are not allowed. Campers choose their site once they arrive. It is not always possible for parties to camp at adjacent sites. Lockup boxes are available for valuable items. Campers wishing to use these should bring their own medium size padlock. If you’re not going to camp in Yoho National Park but feel like stopping for a couple of hours, go to the Faeder Lake Picnic Area, the Finn Creek Picnic Area, or one of several roadside picnic sites beside the Kicking Horse River, all on Hwy 1. The park surrounds the town of Field. 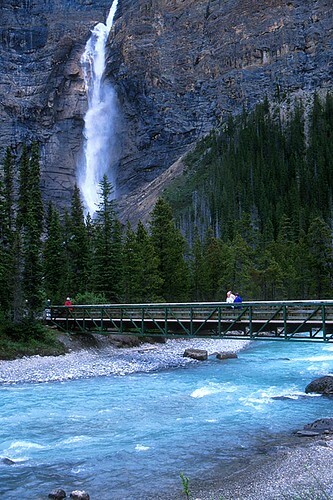 There is extensive hiking along the almost 250 miles (400 km) of trails in Yoho National Park, a park characterized by rock walls and waterfalls. Many of the trails begin beside or near Hwy 1 as it leads through the park. The park’s west gate is located about 16 miles (26 km) east of Golden. Hwy 1 parallels the Kicking Horse River here as it winds through a beautiful, broad valley. The Emerald Lake Trail (easy; 3-mile/5-km loop) leads around the lake, on which the faces of surrounding peaks and glaciers are reflected in stunning detail. The Emerald Basin Trail (moderate; 5.25 miles/8.5 km return) initially follows the Emerald Lake Trail for 1 mile (1.5 km), then climbs steeply through old-growth Douglas fir and western red cedar into the open alpine zone. As the trail approaches Emerald Peak, there are grand views of a hanging glacier on the limestone flanks of the peak. A much easier hike is the Deerlodge Trail (1.75-mile/2.8-km loop) where you can admire elegantly shaped hoodoos. The well-marked trailhead is located a short distance beyond the entrance to the Hoodoo Creek Campground. A 1-mile (1.6-km) hiking trail leads to a view of Wapta Falls and then descends to the gravel beach fanned out below the cataract. To reach the trailhead, turn south off Hwy 1 onto Wapta Falls Road near the park’s west gate and follow it for 1 mile. An even shorter trail leads to the foot of Takakkaw Falls, the third highest in Canada and emblematic of Yoho National Park. In the Cree language, takakkaw means ‘it is wonderful,’ which, coupled with yoho, ‘awe and wonder,’ expresses the exhilaration that most hikers will experience during a visit to the park. To reach the Takakkaw Falls trailhead, turn north on the narrow, winding Yoho Valley Road located off Hwy 1, east of Field. Follow Yoho Valley Road for 8.7 miles (14 km) to the parking lot from where the trail begins. 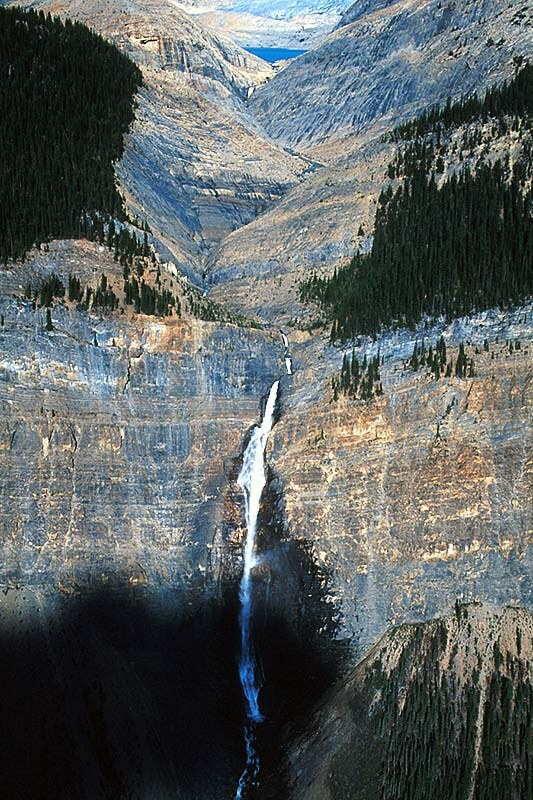 The more demanding Laughing Falls Trail (moderate; 6 miles/9.5 km return) begins from the Takakkaw Falls parking lot and leads to the wilderness campground near Laughing Falls. Along the way, short side trips lead off to Angel’s Staircase, Point Lace Falls, and Duchesnay Lake. Some sections of the Kicking Horse River are navigable by canoe and kayak. Stop at the Visitor Centre for assistance. Canoe and boat rentals are available at Emerald Lake. Power boats are not permitted on park waters. Fishing is permitted in the Kicking Horse River year-round from the confluence of the Kicking Horse and Yoho Rivers to the west park boundary below Wapta Falls. Check the current “Fishing Regulations Summary”. A National Park Fishing Permit is required. Mountain bikes are allowed only on designated trails in Yoho. Designated trails includes these fire roads: Kicking Horse, Amiskwi, Otterhead, Ottertail, Ice River. Check the Backcountry Guide to Yoho National Park, for specific details. Off trail bicycling and cycling on the O’Hara fire road is prohibited. Mountaineering and Climbing route descriptions and photos are available at the Visitor Centre. Anyone wishing to climb Mt. Stephen or travel through Dennis or Duchesnay passes must first obtain a permit allowing them to traverse a restricted area. Park Wardens may also be contacted for assistance in trip planning. Cross-country skiing is a wonderful way to enjoy Yoho National Park in winter. Draped in snow and ice, the Rockies form a dramatic backdrop to the pleasures of travelling over crisp snow through Yoho’s valleys. Waterfall ice climbing in the national parks of Banff, Jasper, Yoho, Kootenay and Waterton Lakes offers an unparalleled experience for the ice climber. A combination of good access, reliable conditions, hundreds of options, and a long season have secured the Canadian Rockies reputation as one of the world’s premier waterfall ice climbing destinations. 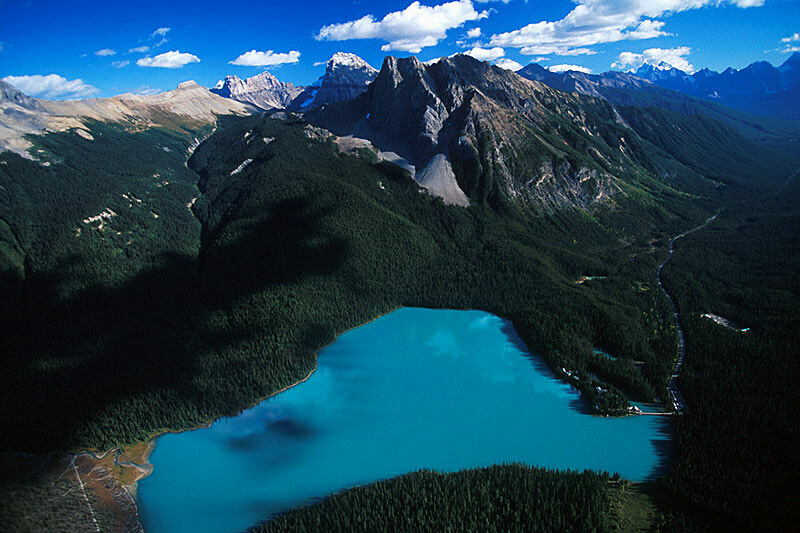 One of the most precious natural resources in Yoho National Park is its deposits of fossils. The remains of more than 120 species of marine animals from the Middle Cambrian epoch (about 515 million years ago) were unearthed in the early decades of last century by Charles Walcott, Secretary of the Smithsonian Institution in Washington, D.C. At the time of his discovery in Yoho National Park, Walcott was the world’s leading authority on Cambrian rocks and fossils. 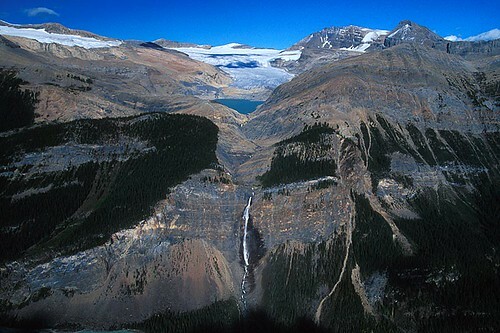 Returning from an outing one day in the Yoho Valley, he split open a slab of shale that was blocking the Burgess Pass. Inside were the fossilized remains of soft-bodied organisms, preserved in greater detail than had ever been thought possible. Between 1909 and his death in 1927, Walcott collected and shipped fossils back to the Smithsonian for classification. 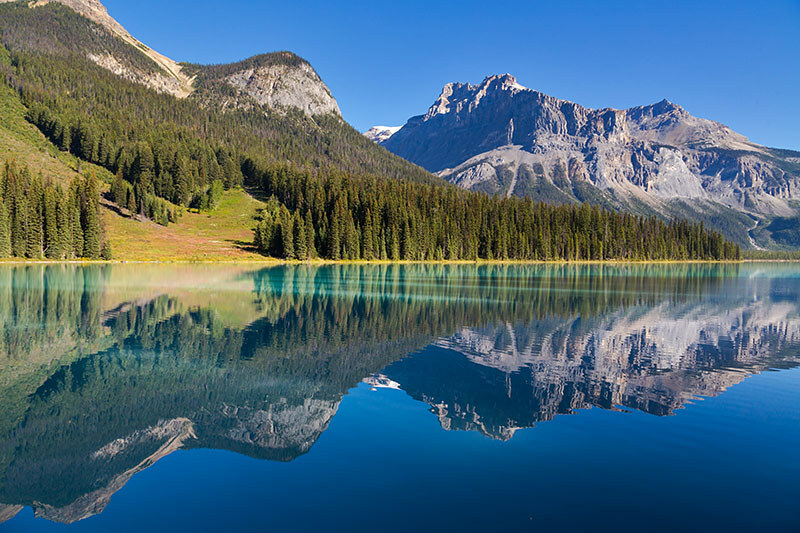 Visitors to the Smithsonian can still see them on display, and visitors to Yoho National Park can view a sampling at the park’s Information Centre. Each year a select group of visitors to Yoho can retrace Walcott’s footsteps. In order to protect the delicate landscape in Walcott’s Quarry and the Trilobite Beds, visitors are allowed access only as part of a guided tour. The hikes are led by licenced guides and limited to groups of 15. Hikes to both locations are lengthy, strenuous all-day endeavours on the steep, scree-covered slopes of Mount Field above Emerald Lake. The tours begin in June and continue through October, weather permitting. For fees, schedules, and reservations, contact the Yoho Burgess Shale Foundation, 800-343-3006. A final note about national park permits: a park pass is required for all visitors to national parks. This pass is available at the park gates or, for the credit-card endowed, by calling (800) 748-7275. You can choose between an annual permit to all 28 National Parks in Canada, a Discovery Package, which includes entry to 28 participating National Parks and 74 National Historic Site; or a daily-entry permit in any of the four contiguous mountain national parks (Banff, Jasper, Yoho and/or Kootenay). In addition, there is a daily camping fee in summer and a weekly or annual charge for a fishing permit. Children under 16 may fish without a permit when accompanied by a licenced angler. Highway 1 runs through Yoho National Park. The town of Field is located in the park and provides basic services. There are voluntary ambulance and fire fighting services, a post office, restaurants, a general/liquor store, a pottery studio, a Greyhound bus flag stop, a lodge and guest houses. Services are also available in Golden and in Lake Louise. To the east, Yoho borders Banff National Park and to the south it borders Kootenay National Park.